“The Last News” reflects upon the personal and collective fears and urge of the media to broadcast the apocalypse. 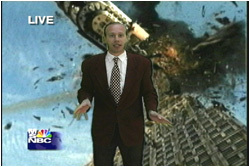 Guy Richard Smith, playing the role of anchorman for MSNBC’s (fictionalized TV-channel) “24 Hour Disaster and Survival Network”, reports apocalyptic events on the background of images taken from science fiction disaster films. Christoph Draeger and Reynold Reynolds” will take place (in Russian).